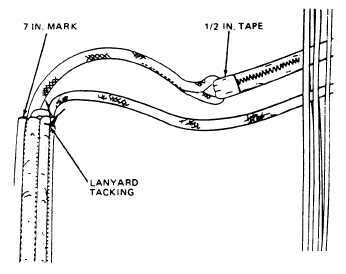 Figure 3-20.Lanyard tacking. Slowly remove the Type I line from the firing lanyard bight. 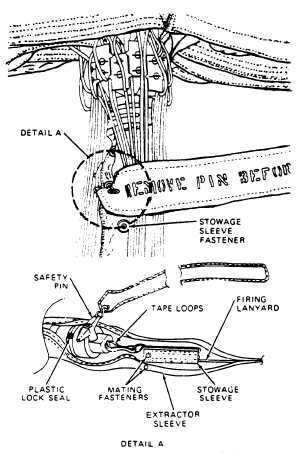 Rapid removal of the Type I line from a firing lanyard bight could damage the lanyard. 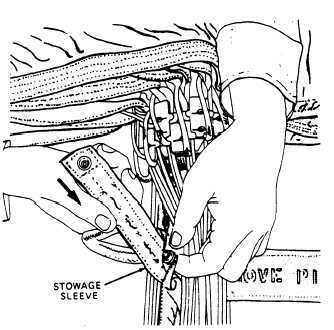 Form and stow an 8-inch bight of firing lanyard in the remaining stowage sleeve channel in the same manner. Tack the second lanyard bight to the stowage sleeve with one turn of waxed size A nylon thread, single. Tie the ends with a surgeons knot followed by a square knot (fig. 3-20). Insert the stowage sleeve into the extractor sleeve, open end first (fig. 3-21). Engage the fastener on the stowage sleeve to the fastener on the extractor sleeve. Engage the extractor sleeve fasteners on each side of the safety pin (fig. 3-22). INSTALLATION OF AUTOMATIC PARACHUTE RIPCORD RELEASE ASSEMBLY You have read about the automatic parachute ripcord release in chapter 2 of this manual. At this time, you will see how it is installed into a container. Before you actually attempt to install a release assembly, (fig. 3-23), you must first make sure that the inspection requirements in the NAVAIR 13-1-6.2 and the NAVAIR 13-600-4-6-3 have been complied with. Now you are ready to proceed with the installation. First, rotate the risers over the suspension lines and position the container on the packing table so that the bottom end is towards the canopy and 3-10 Figure 3-21.Inserting stowage sleeve. Figure 3-22.Engaging snaps.